Question: Are we able to get this plan with 2X6 outer walls? Is there a mechanical chase designed into the plans to get plumbing and HVAC to the second floor? The specifications do not show a basement as an option for this plan is it possible to place on a basement? 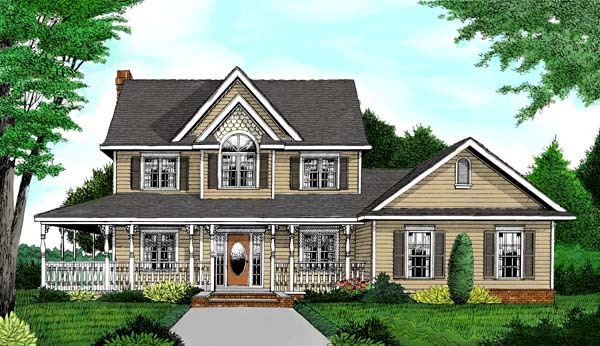 Answer: This plan does have a full basement version that is included in the plans. It has a huge guest bedroom, bathroom, and a really big Family room. I'm sorry I don't have a 2x6 exterior wall version. Your builder should be able to do that as a field modification but, if you need to show it for the inspector, please call for a quote to have the plans modified. Question: My state and county require all new construction homes meet IBC 2012. Will this plan meet those requirements? Answer: This house is designed with features (I.e. structural floor and roof trusses) that will need to be engineered locally based on your area's design criteria. This is standard procedure with a stock home plan. Your builder will know what to do. My plans should be as complete as any stock plan on the market. Your builder will take care of the local requirements. If he has any questions my phone number is on the plans and you and he can call me any time you want during the construction process. Please let me know if you have any other questions.